When in London, one must enjoy afternoon tea. For a very unique (and pink!) experience, try sketch. From the moment you walk into the converted 18th century building, you won’t feel like you’re in London anymore. As you walk through the space, you’ll notice gadgets and art and rooms drastically varying in design. The room for afternoon tea is the pinkest room you’ll ever see. With pink walls, pink chairs, and framed sketches covering the walls, the entire room glows pink. Even the tea I ordered was pink (though it was a rose tea). All of the dishware have words printed on them, such as ‘Ghost,’ ‘Food,’ ‘It’s Not Okay,’ and ‘Forget About It.’ Even the napkins have phone numbers printed across them. It’s a cute detail that grabs people’s attentions. At the end of the meal I ventured up to the restroom to take a look at the space. Multi-colored lights covered the ceiling and each ‘stall’ was a round egg. People were mainly up there just taking photos instead of actually using the bathroom, which was even more bizarre. As you leave the pink room, you’ll see this gorgeous Alice-in-Wonderland-esque garden room. Another great setting for lunch and conversation. Afternoon tea at sketch is a fun way to spend an hour or two, especially with a group of friends or for a celebration. Dress up in your favorite pink outfit and enjoy fresh tea, champagne, and an assortment of delicious sandwiches, desserts, and scones. There’s no better way to conclude a castle exploration than with creamy, delicious gelato. After roaming around Edinburgh Castle in Edinburgh, Scotland, I descended the hundreds of stairs to the historic market place (Grassmarket) where Mary’s Milk Bar welcomes visitors with open doors. Mary’s Milk Bar is incredibly cozy and old-fashioned. Milk Bars, which promoted wholesome milky products, were popular in Britain between the 20s and 60s. Mary, who trained at Carpigiani Gelato University, makes sure all of her products are fresh. The chocolate she sells have a shelf life of no more than six months, and each week she offers new gelato flavors. I loved the Dark Chocolate gelato. It’s smooth and rich and tastes even better in a crunchy waffle cone. The best part about indulging in gelato at Mary’s Milk Bar? The insane view of Edinburgh Castle (which you can see in the background of the first photo). There are only a few tables at Mary’s Milk Bar, so if there isn’t room to sit, take your gelato to go and explore Grassmarket, Edinburgh Castle, and the other many winding streets in Edinburgh. It’s a gorgeous and historic city. If you’re a Rice Krispie treat lover, then Treat House will be dessert heaven for you. Inspired by a successful bake sale, the Russell family expanded into a store when their gourmet treats were a huge success. Treat House is a flavorful twist on a childhood favorite treat. While I normally can’t get enough of good ol’ marshmallow and crisp rice cereal, the flavors here are fun and creative. Whether you’re craving something sweet or savory, there are a variety of options to choose from. With flavors ranging from Birthday Cake to Watermelon to Pina Colada to Cotton Candy to S’mores, there’s something for everyone. An entire store dedicated to sweet rice crisp and marshmallow treats with unique flavors – yum! Visit with a friend and share a few so you can try a bunch of these sweet treats. Russ & Daughters is an appetizing shop in New York that has been run by four generations of the Russ family since 1914. For over 100 years, this shop has sold high quality smoked fish, caviar, and specialty foods. I’ve visited the shop a couple of times, but it’s their cafe, Russ & Daughters Cafe, that I was eager to try. While the cafe gets busy on the weekend, I made it for a weekday lunch and immediately found a seat at the bar. 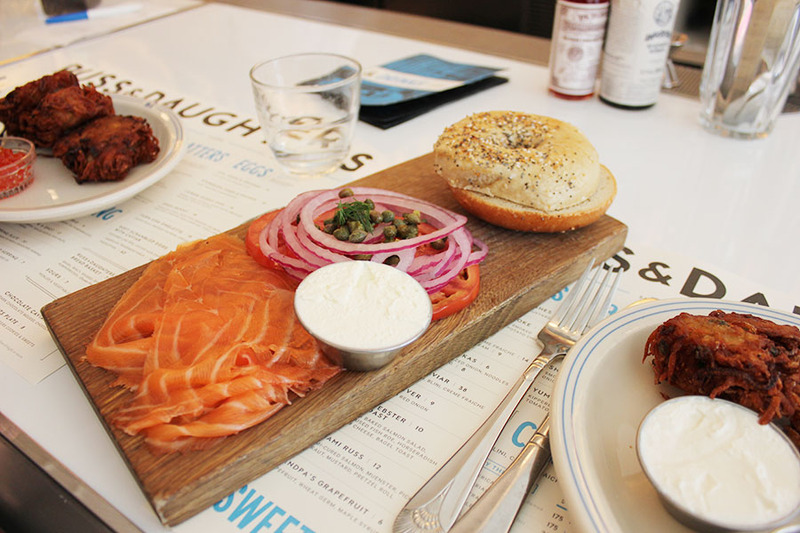 Set in an airy and spacious environment, Russ & Daughters Cafe is a great place to enjoy a casual meal with friends. Bagels, smoked fish, latkes…the menu is filled with so many delicious choices. Matzo Ball soup was an obvious choice to kick off the meal. The Potato Latkes with Applesauce and Sour Cream had my name written all over it, and the The Classic Board with Gaspe Nova Smoked Salmon, Cream Cheese, Tomato, Onion, and Capers rounded out the meal. Such a satisfying lunch. High quality in every bite. The Dutch has been on my list for a while now, so I was excited to try it for brunch a couple of weekends ago. Located on a tree-lined street in Soho, The Dutch has a dark interior that makes it the right amount of cozy. The space is surprisingly spacious, with an open kitchen and a couple of dining rooms to maintain the right amount of privacy. There are so many great items on the menu – there was a lot of debate happening internally. For a delicious and low-key morning, this place is perfect. Start with the Honey Butter Biscuits. They are fluffy, warm, and come with a side of melt-in-your-mouth butter and apricot jam. I still dream about these biscuits. For the main meal, it was hard to resist the Banana Waffles with Cashew, Maple Syrup, and Crème Fraîche. The bananas on top of the waffles reminded me of Bananas Foster – always a good thing. The Smoked Salmon and Bagel with Soft Scrambled Eggs and Trout Roe was another item on the menu that was irresistible. The best part about it? Two bagel tops. Genius. Whenever I’m on the Upper West Side, I always make a stop at Levain Bakery. Though it’s very popular, I’ve only had to stand in a long line once. 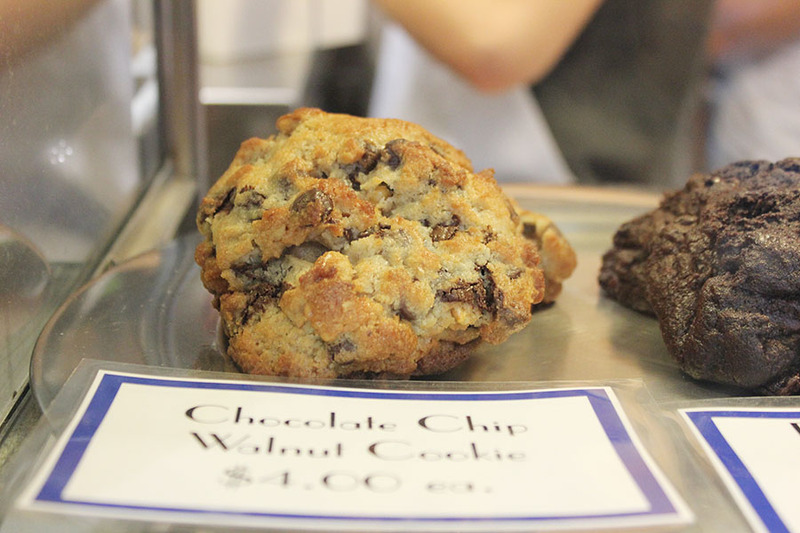 I go just for the cookies, but their bread, pastries, and coffee are frequently ordered items. I find myself dreaming about the Chocolate Chip Walnut cookies, and if I’m really in the mood for chocolate, the Double Chocolate Chocolate Chip (pictured above) hits the spot. The latter is a mix between a fudge brownie and cookie. The cookies are heavy and dense, but incredible. They are crispy on the outside, but soft and doughy on the inside. Though the cookies certainly aren’t inexpensive ($4 each! ), they’re huge and are worth every bite. Visit Levain with a sweet tooth and an empty stomach – you won’t regret it. A friend recommended RedFarm to me years ago, but it wasn’t until recently that I made my way there. RedFarm has a variety of delicious plates that are perfect for sharing with a friend or large group. While I prefer shrimp dumplings, pork buns, and hot and sour soup from places known for their dim sum, RedFarm offers a creative and modern take on Chinese food. It’s fun to sample a bunch of different items and take what you don’t eat to-go. The dishes I tried included the ‘Pac Man’ Shrimp Dumplings, Wild Rice Noodle with Shredded Duck, Pan-Fried Pork Buns, Soft and Crunchy Vegetable Fried Rice, Hot and Sour Soup with Shrimp, and Thai Basil Lemonade. Cue salivation.